The town of East Haddam is located in eastern Middlesex County on the Connecticut River and was once called Machimoodus or the place of noises by the native peoples. In 1662, settlers purchased the land for 30 coats, and the first permanent European residents established homesteads in 1685. In 1734 the town of East Haddam broke from Haddam and incorporated. Early commerce and industry included timber farming, shipbuilding, tanneries, and blacksmiths, and by the mid- 1800s retail shops, taverns, and mills proliferated in the area. 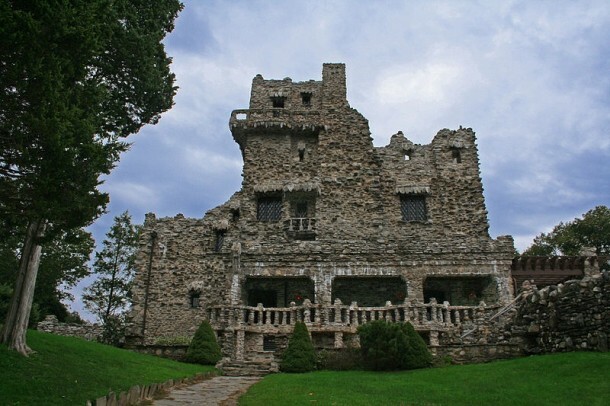 Today, the town is home to the Goodspeed Opera House, a destination for theater-goers, and Gillette Castle, a Connecticut state park. “Amasa Day House.” CT Landmarks, 2016. Link. “Devil’s Hopyard State Park.” Department of Energy & Environmental Protection, 2016. Link. “Gillette Castle State Park.” Department of Energy & Environmental Protection, 2017. Link. “Goodspeed Opera House in East Haddam,” 2016. Link. “Local History: Historical & Genealogical Collections.” Rathbun Free Memorial Library, 2013. Link. “Machimoodus State Park.” Department of Energy & Environmental Protection, 2016. Link. “Nathan Hale Schoolhouse - East Haddam.” The Connecticut Society of the Sons of the American Revoultion, 2016. Link. “Venture Smith Gravesite.” Connecticut Freedom Trail, 2016. Link. “East Haddam - WPA Architectural Survey.” Connecticut State Library Digital Collections, 2016. Link. O.H. Bailey & Company. “View of East Haddam. Connecticut. And Goodspeed’s Landing.” Bird’s-eye Map. Boston, MA: O.H. Bailey & Company, 1880. University of Connecticut Libraries - Map and Geographic Information Center - MAGIC. Link. Field, David. 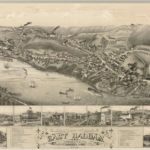 A History of the Towns of Haddam and East-Haddam. Middletown, CT: Loomis and Richards, 1814. Link. Brooks, Lillian. “Life Flows Along Like a River” a History of Haddam Neck. East Hampton, CT: Haddam Neck Genealogical Group, 1972. East Haddam Historical Society, and Bruce Sievers. Mills Along the River: The History of the Cotton Industry in Moodus, Connecticut. East Haddam, CT: East Haddam Historical Society, 1985. Niles, Hosford. The Old Chimney Stacks of East Haddam, Middlesex County, Connecticut. New York: Lowe & Company Book and Job Printers, 1887. Link.